Are you looking for office space near Hyde in Greater Manchester to rent? Then look no further! 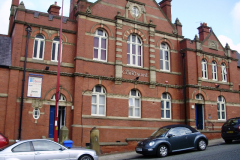 The Old courthouse is located on Chapel Street in Dukinfield right behind the Town Hall. Our Offices are a short 5 minute commute into Hyde town centre at a fraction of the price of an office to rent in Hyde. We also have great access to local motorway networks and the M60 Manchester ring road. The Old Courthouse is a secure business centre with many advantages including affordable office space and in-house internet and telephony services available, as well as secure intercom for visitors and on site (off road) parking.